Join San Pedro in the celebrating of Dia de Los Muertos. On November 1st, this festival will bring life to the streets of San Pedro with traditional Dia de los Muertos art, culture, delicious cuisine and live entertainment. Kids will enjoy the La Muerte Vive! Art Area where they can make a special, free take-home craft.There will be traditional altars on display contributed by local artist and community members You will have the opportunity to take part in a community altar where everyone is invited to leave a picture, personal note or any other small token of remembrance for a lost loved one.Day of the Dead is not a sad occasion or a time for mourning, rather it is when family and friends gather to remember and celebrate departed loved ones. A visit to the Festival wouldn't be complete without a visit to the Festival's Artists' Village. Come as you are or dressed in costume and enter our Costume Contest for a chance to win a fabulous prizes. 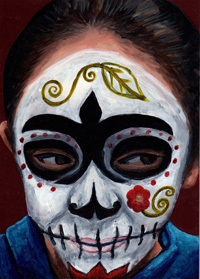 You can also have your face painted to help you get into the Day of the Dead spirit. To add to the fun, San Pedro’s Dia de los Muertos Festival takes place during San Pedro's monthly First Thursday Art Walk, where art galleries and working studios dotting Historic Downtown San Pedro open their doors and present a variety of exhibitions and live music.